Removable wallpaper, quite literally, lets you think outside the box. Sure, it has the word “wall” in it, but whoever said that’s where it’s confined? Possibilities abound with a bit of vibrant paper and no commitment. The stairs? That antique piece in your bedroom? Try giving every small space a pop of color. Since nothing is permanent, you can mix, match, and remove the latest wallpaper print trend until your heart’s content. These style experts decided to place their patterned paper in unconventional areas — no walls required. 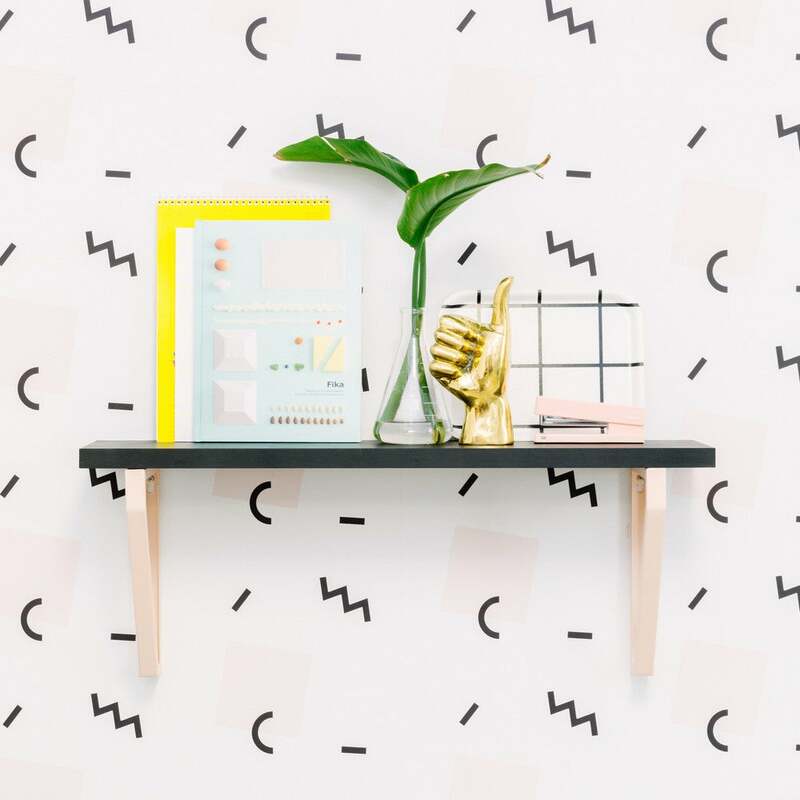 We’re willing to bet these unexpected combinations of the best removable wallpaper ideas will inspire your next DIY project. An oldie but a goodie that’s prime for elevating your drab, dated fridge. Short of having to invest in an entirely new appliance, squeeze a few more months (or years) of life out of your existing one by covering the front with a vibrantly patterned wallpaper. If you’re not inclined to line your walls with an intricate print, why not try the next best thing: the ceiling or the door? Stefania Skrabak, founder of the design firm Art Home Garden believes removable wallpaper is “a great way to try a bold design trend without the commitment.” Test out a funky location and see how you feel. Removable wallpaper is ideal for a spot of your home that’s overlooked. If there’s a mantle collecting dust, revive it with a fun pattern. That’s exactly what interior designer Nichol Naranjo does. Her unused fireplace (emphasis on “unused”) gets the removable wallpaper treatment. “I actually have a two-sided board with two different pattern wallpapers for my faux fireplace so that I can easily switch it back and forth,” she said. Let our wallpaper fireplace give you some cozy vibes. You can paint blocks of wood for an extra measure to really complete the look. Elizabeth Rees built her business on the motto “Peel it, stick it, love it.” As the founder of Chasing Paper, she sees anything and everything in the home as an opportunity. “Removable wallpaper is an easy and affordable way to give new life to virtually anything,” she said. “Think beyond walls – from adding pattern or color to your fridge [or] to a stairway.” Naturally, this means that everyday items, not just furniture, are able to get the DIY treatment. Interior designer and HGTV Design Star finalist Cathy Hobbs has a few tricks up her sleeve. Rather than settle on one type of wallpaper, she has provided a way to use all of the patterns you love. She understands that sometimes choosing is just too hard. “Framing wallpaper has long been a secret design technique of designers looking for affordable art solutions,” she said. “It provides a bold, colorful, and graphic solution at an approachable price.” With the option to replace patterns easily, you can swap the removable wallpaper you’ve framed whenever you’d like. Feeling warm hews for the winter and cool colors in the summer? Give it a whirl. Give an ordinary wall clock a new lease on life with a colorful revamp courtesy of a playfully patterned removable wallpaper. This print, featured here from Chasing Paper, is one easy way to give an outdated decor accent an easy and simple refresh. Though Wallpop’s marble wallpaper is a hit stylistically, it is definitely going to get messy, but Dean isn’t sweating it. “I don’t have to worry about them coloring it blue since I can easily remove and replace with a fresh piece!” Her suggestion before starting the 20-minute project? Make sure to remove all crumbs — little bits of cookies will ruin the smooth surface you’re aiming for. This story was originally published August 2017. It has been updated with new information.